10. ‘Hagseed’ by Margaret Atwood. Brilliant, brilliant writing by one of Mum and I’s favourite authors! This re-imagining of Shakespeare’s Tempest is another in the Hogarth Shakespeare initiative, (regular readers of my blog will remember me reviewing Vinegar Girl by Anne Tyler earlier this year), and as always, Ms Atwood has delivered an outstanding piece of work. It’s fabulous. This is written with such energy that it feels like a story Ms Atwood would have written anyway, if the Bard had not already done so. It’s a magical eulogy to Shakespeare, taking you through an extraordinary reworking of the original tale, but including nods to contemporary culture; thrilling to anyone who knows the original play, but equally compelling to those who don’t. Our hero, Felix, was the artistic director of a theatre company until he was betrayed by his assistant who orchestrates a coup that destroys Felix, leaving him in self imposed isolation for years. Not on an island, but deep in the Canadian countryside in a ramshackle cabin with only his imaginary daughter, Miranda, for company – his wife and child are long deceased, and the grief he still feels at the loss of his real three year old Miranda to meningitis had fuelled his plans to stage his masterpiece, a wildly conceptual version of the Tempest, now stolen from him by the villainous assistant, Tony. After twelve years of navel gazing and almost endearingly strange behaviour, eventually he concludes that there are only two things left for him to do – “two projects that could still hold satisfaction”. First, he needs to get his play back. Secondly, he wants revenge. The scheming Tony and his evil cohort Sal must suffer for their treatment of him. As Felix Phillips, he is finished, so he reinvents himself, and it is as Mr Duke that he takes on a job in a correctional facility in a Literacy through Literature programme of Shakespeare….where he directs the prisoners in, of course, The Tempest! This is just so skilful. We have now got a play within a play, within a novel, and it is thrilling! The prison scenes are wonderful. The characters are so real, and deftly handled. There’s no foul language allowed in class or rehearsal save that which comes from Shakespeare, whence comes the title, hagseed. I’ve had a large fridge magnet for years, its been around the world with me, featuring some of Shakespeare’s choicest insults, so I particularly enjoyed this. And, yes, Felix succeeds in both his projects. The ending is a tumultuous climax with a footnote of an analysis by the prisoners on what should happen next in The Tempest. Fabulous. This book of Mum’s has already been claimed by a dear friend living in Indonesia, but I strongly advise you to find yourself a copy; it’s one of the best books you will read this year! 1. ‘Vinegar Girl’ by Anne Tyler. This is The Taming of the Shrew, re-imagined and re-written as part of the Hogarth Shakespeare Project to commemorate the 400th anniversary of the bard. Set firmly in the 21st century, Kate finds herself, somewhat to her surprise, looking after her eccentric (mad scientist) father and her younger sister, while working in childcare where her tendency to speak her mind, (or not – “I had nothing to say, so I said nothing”), emphasises her individuality, strength and feelings of being an outsider, different from the norm. When her fathers lab assistant, Pyotr, is threatened with deportation, her father hatches a plot to marry him to Kate in order to keep him in America and complete his research. 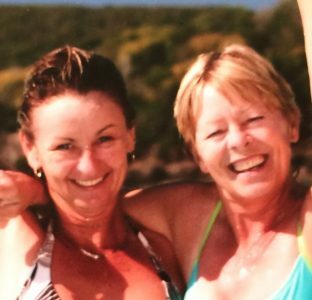 Mum was a strong, independently minded and extremely intelligent woman herself, like Kate, and she’d definitely have told Kate to stand up for herself, and supported her all the way in her desire for individuality and independence. It may have been difficult to overcome the male supremacy of the original tale, but Ms Tyler does it effortlessly, making Kate’s awkwardness (shrewishness) genuinely endearing. Will she, a thoroughly modern woman, be able to resist the pressure to be sacrificed for her fathers career? Every character is perfectly formed and believable, especially Kate’s scant family who are brilliantly drawn. I particularly enjoyed the wedding planning scenes, the delight of her Aunt Thelma at having a wedding to plan meeting the resistance of Kate to any fussiness. I don’t want to give away the ending, although if you’re familiar with Shakespeare, you’ll know where this should go. Ms Tyler does it with such style though, making this a really easy and enjoyable read. Love, love, love it, and I’m giving it 8/10!